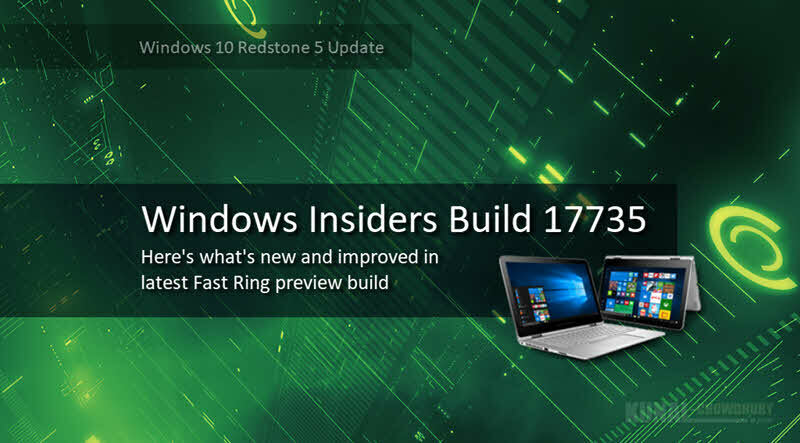 Within two days after releasing Windows 10 preview build 17733 for PC to the Fast Ring, Microsoft released one more Windows 10 build (17735) from the Redstone 5 (RS5) branch to the Fast Ring Windows Insiders. As Microsoft going forward to release the next major upgrade of Windows 10, this build does include only general improvements and fixes. Continue reading to know about the general improvements and fixes part of this build. If you are a Windows Insider in the Skip Ahead, Microsoft has pushed a new build for you too. Here's what's new and improved in latest Windows 10 preview build 18214 for insiders who opted for Skip Ahead. What's new and improved in Windows 10 build 17735? Fixed an issue in Windows Mixed Reality where the voice command, "Flashlight on" would fail to activate the flashlight feature. Fixed an issue resulting in Notepad's "Search with Bing" feature searching for "10 10" instead of "10 + 10" if that was the search query. Fixed an issue where Ctrl + 0 to reset the zoom level in Notepad wouldn't work if the 0 was typed from a keypad. Fixed the issue where Narrator said "Not a Narrator command" when navigating Win32 menu bar items. On Windows 10 in S Mode, launching Office in the Store may fail to launch with an error about a .dll not being designed to run on Windows. The error message is that a .dll "is either not designed to run on Windows or it contains an error. Try installing the program again..." Some people have been able to work around this by uninstalling and reinstalling Office from the Store. We're investigating a potential increase in Start reliability and performance issues in this build. If you have come this far, it means that you liked what you are reading (Here's what's new, improved and still broken in latest Windows 10 preview build 17735 for Fast Ring (RS5)).